Billy Waters was probably born in America or the Caribbean. He lost a leg serving in the British navy during the Napoleonic wars. When he was discharged he supplemented his meagre pension by busking with his fiddle on the streets of London, especially outside the Drury Lane Theatre. He lived nearby with his family in the St Giles district. Billy was an eccentric character, well known for his exuberant personality and feather hat. He died destitute in the workhouse in 1823, having pawned his fiddle shortly beforehand. There are several representations of him. This porcelain figure was made in northern England by Edward Keys at a factory in Derby, where Keys also modelled figures of a black woman known as 'African Sal'. 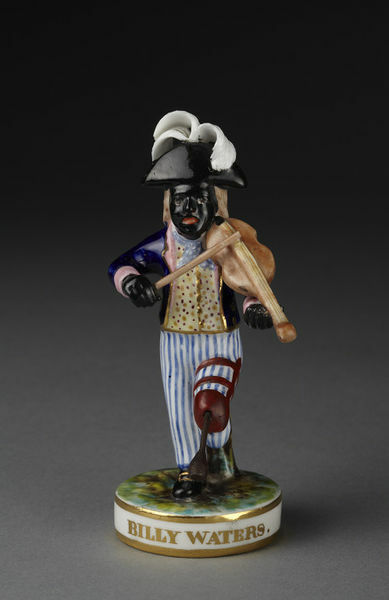 The production of these black personalities was part of a strategy to revitalise figure production by appealing to a market that had long been supplied by the makers of (cheaper) Staffordshire earthenware figures. 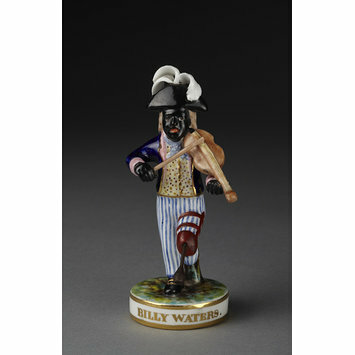 There are several different Staffordshire models of Billy Waters, including one in the V&A (inv. no. C.38-2002). This Derby porcelain figure was a re-issue, made as late as 1862, long after Billy Waters's death, and therefore testimony to his lasting popularity. A print of Waters by George Cruikshank appeared in Life in London (1821), which includes several images of black people. The book was adapted as an opera and ran for 300 performances, finally forced to close only because the actors were exhausted. Figure of a black man playing a fiddle. He is wearing a black hat with white feathers, a blue jacket with pink collar and cuffs, and blue and white striped trousers. He has one peg leg, strapped to the left thigh and wearinga black shoe with a gold buckle on his right foot. The figure is standing on a round base with the name 'Billy Waters' written in gold on the front. crown and crossed batons with six dots, flanked by S and H, painted in puce. No 3 incised.